Dave Matthews’ music is as colorful, diverse, and uncategorizable as the man himself. His sounds do get categorized -with clumsy media labels like “jam band rock,” “bebop pop,” or his own tongue-in-cheek offering, “Con-fusion” – but these terms never do them any justice. His out­put must ultimately be appreciated for and perceived as what it is – adventurous and eclectic modern music for everyone. Raised in South Africa and now a native of Charlottesville, Virginia, Dave leads the currently very popular Dave Matthews Band. The five-man group includes the unique instrumentation of violin and saxo­phone in the lineup, generating some uncommon and compelling timbres which stretch the boundaries of pop music to extremes, and proving that pop songs do not have to be filled with cliches to reach the masses. Dave’s quicksilver guitar style is acoustic-based and distinguished by percussive strumming and intriguing lead/rhythm playing, delivered on a Gibson Everly Brothers model acoustic (in the studio) or a Gibson Chet Atkins (on stage). The colorful, diverse, and uncatego­rizable Dave Matthews sound is captured beautifully on the Under the Table and Dreaming release, and the stellar track Satellite. The main riff, Riff A, is a perfect example of what Dave calls “circular modal motion.” He admits to “try­ing to find the right drones to build bridges on,” and this is what we get in “Satellite.” The intro lick, Riff A, also heard in the verses and inter­ludes, is a noteworthy case in point. It is composed of per­fect 5th intervals moving in mostly two-note units around the fretboard, setting up a droning, hypnotic pat­tern in 3/4 time. Let’s look a bit closer and break it down into easy-to-digest sections. The first component is a chord stack built from two perfect 5ths in a row [Fig. 1]. This voicing emphasizes wide intervals, Ab-Eb-Bb and can be seen as two root-5th power chords combined. The remaining notes in the riff are also arranged in 5ths, and played at the 4th fret (Db5), 3rd fret (C5), and 1st fret (Bb5) [Fig. 2]. Dave plays the riff in single-note form which emphasizes the angularity of its wide interval perfect 5th melody. The con­cept of building chords and riffs on perfect 5ths, called quintal harmony, is not a new one in rock. It’s an approach favored by Andy Summers (“Message in a Bottle”) and Steve Vai. The chorus figure, Rhy. Fig. 1, expounds on the quintal concept. Here, Dave uses a high Ab5 form on the 3rd and 4th strings as the axis or center of the activity. The other voicings pivot around this shape which is established in the first measure of the figure [Fig. 3]. 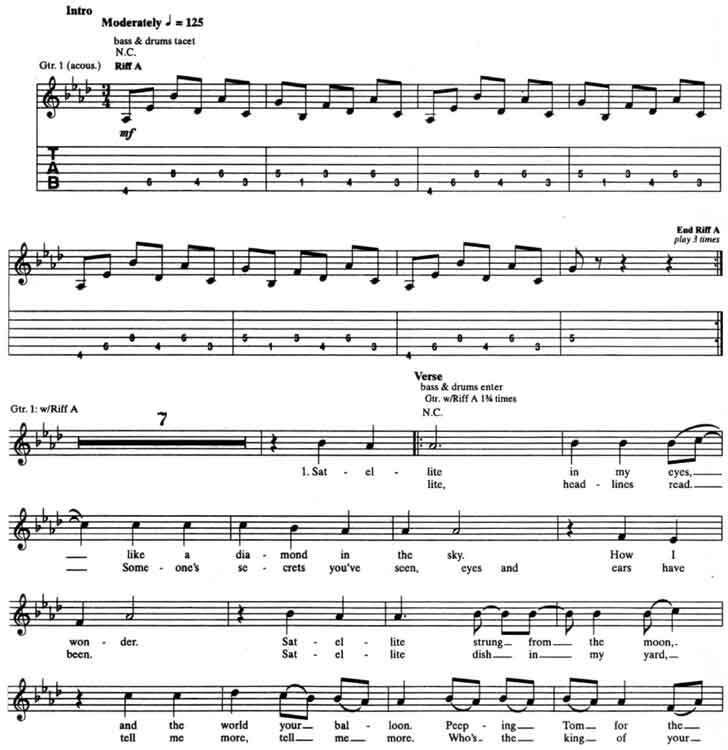 The rhythm approach in the chorus features Matthews’ buoyant strum style which drives the section forward smoothly. It’s a part of Dave Matthews Band Satellite guitar tab and sheet.